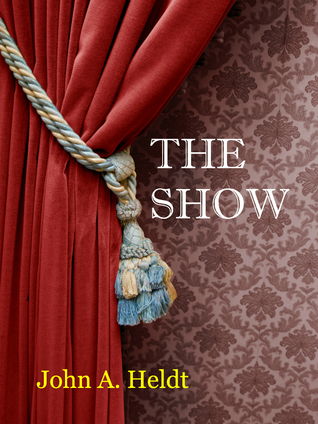 The Show by John A. Heldt is a sequel to one of my favorite books of 2012, The Mine. It starts by recapping some of the happenings from the first book, but from the perspective of Grace Vandenberg, who falls in love with a time traveler named Joel. Grace discovers the letter that Joel left behind earlier than she was supposed to, and follows him forward in time, from 1941 to 2002. Although it was a bit of a recap, it was fun to read the story from Grace's perspective. Heldt shows us how she adapts to this new world before she finally finds Joel in modern-day Seattle. We then watch as Grace and Joel build a life and family together. And then Grace is suddenly transported back to 1918. I will admit that I would have liked to have read more about Grace in 2002 than having her thrown back in time. But it was an interesting story, and heartbreaking as she struggled with being away from her husband and children. The main issue I had was that there was a bit of a romance story in 1918. I had a hard time believing this as Grace was so in love with Joel that she followed him into the future; how could she consider a relationship with someone else? Overall, though, it was a nice follow up to The Mine. I enjoy Heldt's writing style and ideas, as well as the way he immerses his characters into the culture of the time in which they are living at any given moment. If you enjoy time travel stories, definitely check out The Mine and The Show. This review was written based on a copy of The Show that I received from the author in exchange for an honest review. I always find it interesting when an author shows you multiple perspectives. I'm glad you enjoyed this one!